After 2 hours drive from Paris with a stop for delicious coffee and croissants, the tour starts with a visit of CHAMBORD, the immense and unique palace of Francois I, built at the turn of the Renaissance period. You will take the double-turn spiral staircase designed by Leonardo da Vinci head to the Royal Apartments of François I and Louis XIV, immerse on the floor above in the world of royal hunts and continue to the terraces where you will find yourself surrounded by roofing and chimneys forming a fairytale village that offers a magnificent panorama. Chambord is much more than just a castle; it is an architectural gem, a stone colossus, the dream of a young king comes true. 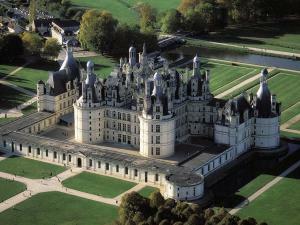 After visiting Chambord and a wonderful drive along the Loire River will bring you to the town of Amboise where you can visit the CHATEAU DU CLOS LUCE Leonardo da Vinci’s last residence that is dedicated to conveying an overall picture of the art and the boundless vision of the Tuscan artist. In this residence , you will see his bedroom, his kitchen, his study, the Renaissance halls, the chapel. After having a delicious lunch in a nice, typical restaurant of the Loire Valley, you will be drive to the CHATEAU DE CHENONCEAU. This amazing castle has always attracted talent and inspired great artists, conveying beauty and combining the elegance of architecture with that of the spirit. The Room of the 5 Queens, the living room of Louis XIV, the Grand Gallery overlooking the Cher River, the Green Cabinet of Catherine de Medici, the Royal chapel takes you back in time to share the dreams of Chenonceau and reveal its secrets. That is an exceptional site with its original design, the richness of its collections (Murillo, Il Tintoretto, Poussin, Il Correggio, Rubens Il Primatice, Van Loo…), its furniture , its decorations and gardens, but also because it was loved by extraordinary women who have marked history like Diane de Poitiers, Catherine de Medici, Madame Dupin.